If you are under investigation or have been charged with a crime, your criminal defense attorney is your lifeline. Whether it is a misdemeanor offense or a murder charge, you should not attempt to handle any stage of a criminal case without the advice and counsel of a defense lawyer. 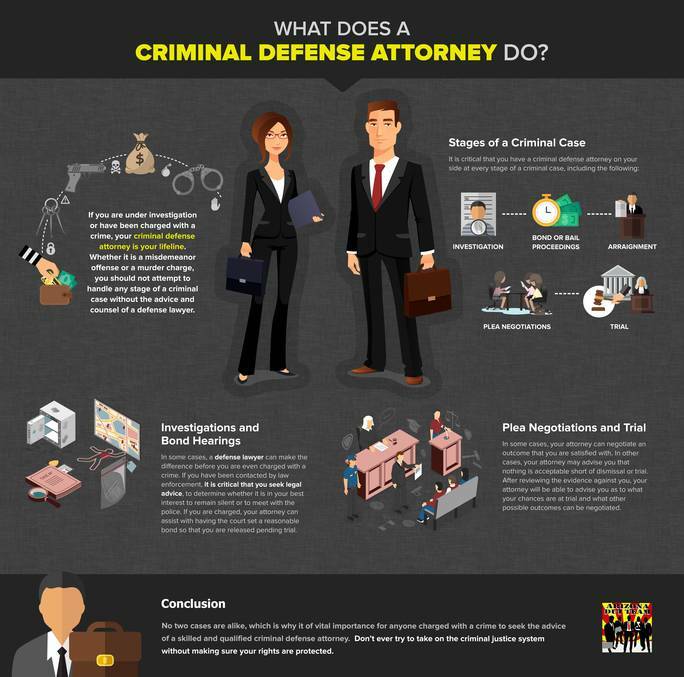 In some cases, a defense lawyer can make the difference before you are even charged with a crime. If you have been contacted by law enforcement, it is critical that you seek legal advice, to determine whether it is in your best interest to remain silent or to meet with the police. If you are charged, your attorney can assist with having the court set a reasonable bond so that you are released pending trial. In some cases, your attorney can negotiate an outcome that you are satisfied with. In other cases, your attorney may advise you that nothing is acceptable short of dismissal or trial. After reviewing the evidence against you, your attorney will be able to advise you as to what your chances are at trial and what other possible outcomes can be negotiated. No two cases are alike, which is why it of vital importance for anyone charged with a crime to seek the advice of a skilled and qualified criminal defense attorney. Don’t ever try to take on the criminal justice system without making sure your rights are protected.